Important: This review was written in 2009 and covers the first official RC Warthog, which was 8" long. In 2010, a new, larger, 14" long version was released, and you can see its video and review here. I want to start by coming clean on behalf of most of the folks who would be interested in this vehicle. It may be a small, simple RC toy designed for fairly young kids, but let's just be honest here. This thing is for the Halo game fans of the world, of all ages. You know who you are! If you've spent more than a minute running back & forth between YouTube and your XBOX 360 to track down "skulls" or you know the respawn rate of the invisibility power-up on your favorite map, to the second, it's not going to matter how well this car performs. You want it no matter what. I mean, face it, it's a Warthog! And it's radio controlled! Obviously I'm excited that an RC Warthog was even made in the first place, but I will still fulfill my duty to you and evaluate it with fairness. Wel, first off, it's worth noting that this is an official, licensed product made for Microsoft. It shows, too. The body (about 8" long), tires, and wheels look great and have an unusually high amount of hand-painted detail for such an inexpensive vehicle. Best of all, it comes with Spartans! Two of them! Both have moveable arms and legs, and their heads turn.Unfortunately, though, neither one can stand up outside of the vehicle, as the blue guy has weird-shaped legs and the green one (Master Chief, I presume) has pegs under his feet that line up with holes in the gun turret base. Speaking of the turret, it can be rotated around 360 degrees by hand, and it can also be angled up or down. The only place detail is noticeably lacking is between the front wheels, where there's a pretty flat, boxy, functional housing that keeps the steering components safely protected. Preparation is simple -- four AA batteries go in the car, and two in the controller. What's interesting is that for the very small, kid-friendly controller, one battery goes in each side, behind separate battery bay doors. I expected the Halo RC Warthog to be about as fast (or should I say slow) as any typical 6V small car like those from Tyco, and I was right. The actual speed is not impressive at all if you are a tall adult standing back a good distance, but sit down closer to it (or if you're a kid), and you'll actually notice that the speed is pretty realistic for its size. Controls are your basic forward/reverse and left/right,and everything is pretty responsive. It doesn't have any suspension springs, though, so it really can't go off-road much except on fairly hard dirt with only small bumps. I tested the car with a friend and we were interested to see how well the gunner figure would hold on while the car is driven around, and unfortunately he falls right off, really quickly. You'll be better off sticking him in the passenger seat (which requires squishing his legs together a bit -- it's a tight fit). Or, pull out the blue guy and let Master Chief be the driver. The Chief is usually a better driver than the other guys anyhow. 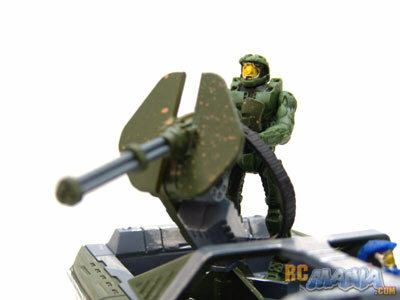 Like I said in the beginning, it's a Warthog from Halo, and it's RC! What more do you want? It's not a great-performing RC, but it's not bad either. 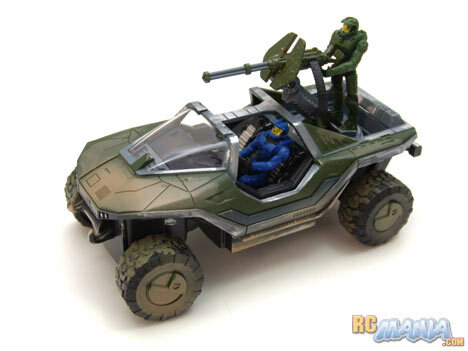 I'd rather pay $5 less for an RC of this size and speed, but, the quality of the design, the realistic hand-painted details, and the fact that it's a pretty faithful rendition of the most iconic vehicle from one of the most popular & successful video game series of all time, make the Halo RC Warthog worth every penny. For diehard Halo fans, it looks cool just sitting on your desk or a shelf, and being able to drive it around a little is just a big bonus. For kids age 5 and up, it's a great-looking toy with the bonus of two action figures and a moveable gun, and it's the right speed to have fun without getting into any trouble.